The Pretty Woman roll from QQ Sushi. Each year when it's time to plan my significant other's surprise birthday dinner, I spend a good month or more researching menus of locally owned restaurants, and considering all the places we've never tried along with the spots we know and love. Without a doubt the largest tab I'll pay and one of the most indulgent meals we'll have each year (besides my birthday), a lot of thought goes into this decision. He and I have discovered many favorites over the years — the following included (and others not). Let it be known that a full, four-course meal at any of these spots is more than satisfying, in both flavor and experience. It was the name that sold me. (In my nerdier pursuits, I confess a preference for necromancy-skilled characters.) I'm also the sort who likes my cocktails light and crisp — another favorite standard being the Moscow Mule, but I'll typically try anything that's not too sweet. The first listing in Clover's "crisp" category, the Corpse Reviver No. 2 is an unexpected kick in the pants. A concoction of gin, triple sec, Lillet, lemon juice and a splash of absinthe — with a cherry garnish — the resulting tart, slightly sweet, piney mixture is less intimidating on the tongue than it sounds. I've also been delighted to discover that this particular cocktail has quite the storied history. Made famous in the 1930s by the renowned bartender Harry Craddock of London's Savoy, earlier mentions of the Corpse Reviver date back to the 1860s. A "hair of the dog" drink, it was developed as a potion to revive one's wilted corpse after a night of revelry. On the menu at Clover for the past several years, bar manager Sean Rovick says the original Corpse Revivers (No. 1 and 2) have spawned a bevy of inspired offspring, though its second incarnation still reigns as the one drink to revive them all. A longtime favorite that's now in its 10th year, there's not a poor choice on the menu at Wild Sage, which holds to the mission "local whenever possible." This means a fresh rotation of seasonal dishes complement its year-round mainstays, like the star of its starter menu: the Yukon Taquitos. A Southwestern twist on a local ingredient (Yukon potatoes), the creamy potato base is stuffed into a crisp tortilla and garnished with avocado slices, salted cabbage and a side of spicy chili lime sauce for dipping. The shareable, four-piece dish is memorably served on a plate with a printed border of beer bottles, a fun divergence from Wild Sage's white linen atmosphere. With its cozy, unassuming spot in the Five Mile Shopping Center, QQ Sushi has established itself as a North Spokane go-to for fresh Japanese cuisine since it opened almost two years ago. You might have to wait a while for a table at this popular stop, which also serves a steady stream of takeout customers. No matter the roll you order, QQ's chefs pay utmost attention to presentation, with artful garnishes and designs drawn in Sriracha sauce on the plate. 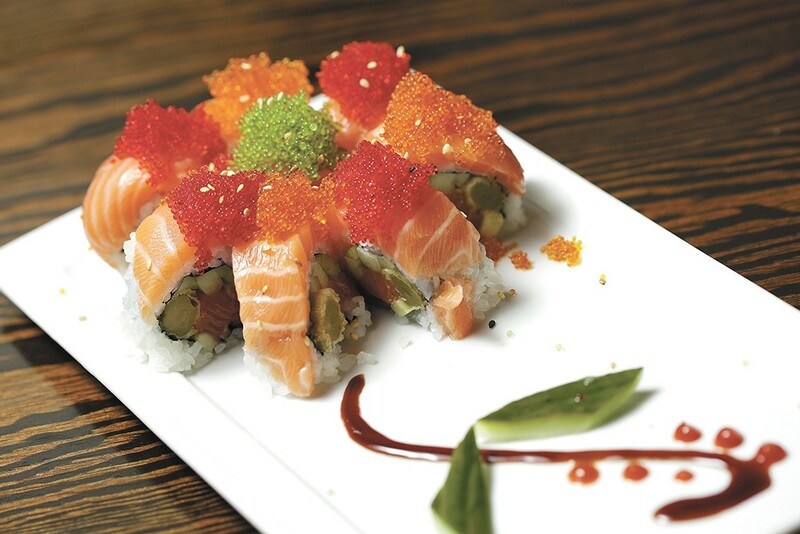 Each time I visit QQ, we get the Pretty Women Roll, with cucumber, asparagus and salmon inside, topped with bright green and red tobiko; or dyed roe. Two of QQ's specialty rolls are ideal as a shared entrée for a multi-course dinner. To mix up your fish, pair Pretty Women with the tuna-based "Fresh" roll, with shrimp tempura inside and topped with salmon and fresh lemon, adding a tart contrast to the savory fish.